One of the paramount problems Dowding faced throughout the Battle of Britain was the growing shortage of qualified fighter pilots. New pilots could not be trained in sufficient pace to replenish combat losses, so Dowding had to use all means at his disposal to reinforce the Fighter Command with more airmen. When squadrons became exhausted, obviously the most satisfactory way of reinforcement was by means of moving complete units, and this was done when time allowed. Serviceable aircraft were transferred by air, and operational aircraft crews, about 35 men per Squadron, were transferred by civil aircraft put at my disposal for the moves. The remainder of the personnel travelled by train or motor transport according to circumstances. Some of the distances involved were considerable, as for instance when a Squadron from Wick had to be brought down in the London area. The first-line strength of a Squadron was 16 aircraft, of which not more than 12 were intended to be operationally available at any one time. The other 4 would normally be undergoing Inspection or Overhaul. In addition to this there was a small reserve-of three to five -aircraft per Squadron available on the station. There was a limit to the number of trained pilots which could be kept on the strength of a Squadron even in times of operational passivity, because not more than about 25 could be kept in full practice in flying duties. A fresh squadron coming into an active Sector would generally bring with them 16 aircraft and about 20 trained pilots. They would normally fight until they were no longer capable of putting more than 9 aircraft into the air, and then they had to be relieved. This process occupied different periods according to the luck and skill of the unit. The normal period was a month to six weeks, but some units had to be replaced after a week or 10 days. Air Vice Marshal Park found that the heaviest casualties were often incurred by newly-arrived squadrons owing to their non-familiarity with the latest developments of air fighting. It soon became impossible to maintain the to-and-fro progress of complete unit personnel from end to end of the country, and the first limitation to efficiency which had to be accepted was the retention of the majority of personnel at Sector Stations and the transfer only of flying personnel and aircraft crews. This limitation was regrettable because it meant that officers and men were strange to one another, but worse was to come. By the beginning of September the incidence of casualties became so serious that a fresh squadron would become depleted and exhausted before any of the resting and reforming squadrons was ready to take its place. Fighter pilots were no longer being produced in numbers sufficient to fill the gaps in the fighting ranks. Transfers were made from the Fleet Air Arm and from the Bomber and Coastal Commands, but these pilots naturally required a short flying course on Hurricanes or Spitfires and some instruction in formation flying, fighter tactics and interception procedure. I considered, but discarded, the advisability of combining pairs of weak units into single squadrons at full strength, for several reasons, one of which was the difficulty of recovery when a lull should come. Another was that ground personnel would be wasted, and a third was that the rate at which the strength of the Command was decreasing would be obvious. (a) The units of 11 Group and on its immediate flanks, which were bearing the brunt of the fighting. (b) A few outside units to be maintained at operational strength and to be available as unit reliefs in cases where this was unavoidable. (c) The remaining squadrons of the Command, which would be stripped of their operational pilots, for; the benefit of the A squadrons, down to a level of 5 or 6. These C squadrons could devote their main energies to the training of new pilots, and, although they would not be fit to meet German Fighters, they would be quite capable of defending their Sectors against unescorted Bombers, which would be all that they would be likely to encounter. The necessity for resorting to such measures as this indicates the strain which had been put on the Fighter Command and the pilot training organisations by the casualties which the Command had suffered in this decisive Battle. About this time one Canadian, two Polish and one Czech squadrons became fit for Operations. A squadron of Canadian pilots of the Royal Air Force (No. 242) had been in existence for some months, and was one of the squadrons which went to France in June to cover the evacuation from the West Coast. On its return it became one of the foremost fighting squadrons in the Command, under the leadership of the very gallant Squadron Leader D. R. S. Bader, D.S.O., D.F.C., No. 1 (Canadian) Squadron, now also came into the line and acquitted itself with great distinction. I must confess that I had been a little doubtful of the effect which their experience in their own countries and in France might have had upon the Polish and Czech pilots, but my doubts were soon laid to rest, because all three squadrons swung in the fight with a dash and enthusiasm which is beyond praise. They were inspired by a burning hatred for the Germans which made them very deadly opponents. The first Polish Squadron. (No. 303) in No. 11 Group, during the course of a month, shot down more Germans than any British unit in the same period. Other Poles and Czechs were used in small numbers in British squadrons, and fought very gallantly, but the language was a difficulty, and they were probably most efficiently employed in their own National units. 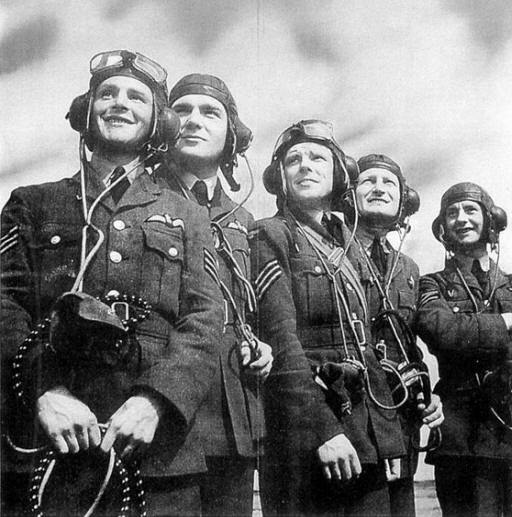 Other foreign pilots were employed in British squadrons, but not in appreciable numbers. The American “Eagle” Squadron was in process of formation during the Battle. 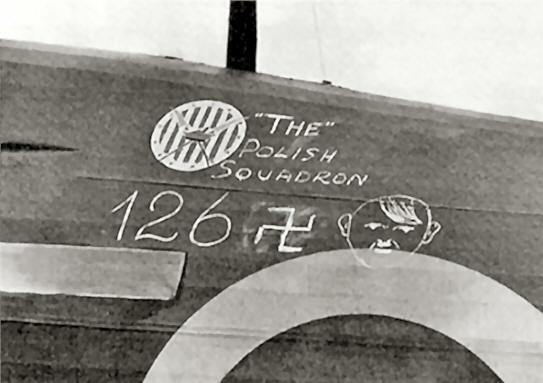 The best-scoring non-commonwealth unit during the Battle of Britain was Polish No. 303 Squadron on Hurricanes. It became operational with No. 11 Group in the last days of August and saw heavy action during the following weeks. The squadron claimed no less than 126 German aircraft shot down until the end of October. Although it is now known that this tally was exaggerated, the Poles undoubtedly made significant contribution in the later part of the Battle, and even more so in the years to follow. The Auxiliary squadrons were by this time practically indistinguishable from regulars. It will be remembered that the Scottish auxiliaries were responsible for the first air success of the war in the Firth of Forth. To set off against the discontinuity of their training in peacetime they had the great advantage of permanency of personnel, and the Flight Commanders at the outbreak of the War were senior and experienced. At the same time, this very permanence led to the average age of the pilots being rather high for intensive fighting, which exercises a strain which the average man of 30 cannot support indefinitely. This point has now ceased to be of importance because of fresh postings. It is mentioned only because it is a factor to be kept in mind in peacetime. No praise can be too high for the Auxiliaries, both as regards their keenness and efficiency in peace time and their fighting record in war.